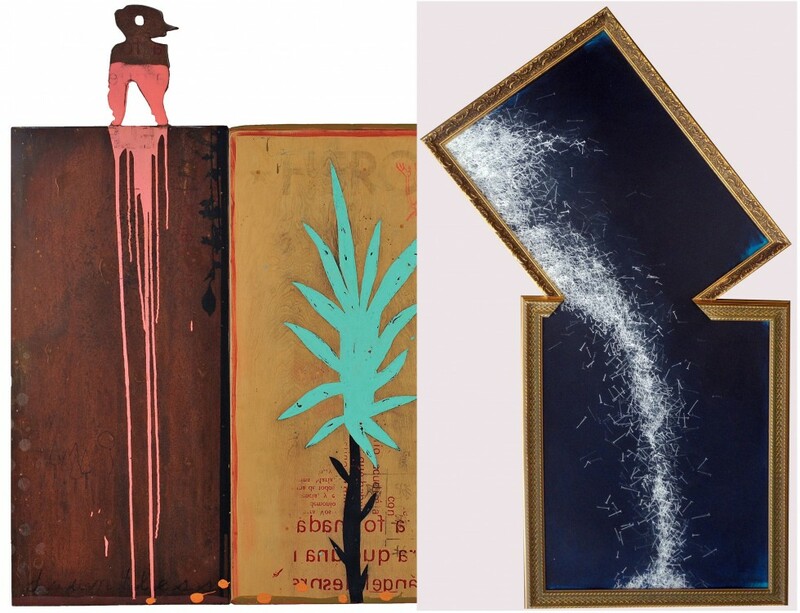 Entering the heart of the Fall arts season, Modified Arts is proud to present new solo exhibitions from two veteran artists, John Adelman and John Randall Nelson, playing with figuration in their respective media. Adelman’s “Further Still” is presented alongside another solo exhibition in his home of Houston, “Further,” both of which involve the artist’s addressing of the margins between the real and the art object, all begun with his drawing of a deconstructed Japanese pachinko machine. The mixed-media pieces focus on hyper-detailed drawings, variously framed, paired with pieces of the objects themselves, often sticking straight out of the wall. Nelson’s “Words Are Meaningless” similarly deconstructs its own title. Though at first presenting recognizable objects in his works on panel, the artist presents them amidst a foreign landscape, rendering them wholly unfamiliar in what they might now represent. The vocabulary is familiar, but the syntax is instead quite foreign. John Adelman is a mixed-media artist, hailing from Houston, TX. For his first Arizona solo show, the artist will present a series of works continuing his deconstructed drawings–playfully representing objects smashed, crushed, crumbled, and disassembled. Adelman is represented by Nicole Longnecker Gallery in Houston, Diane Rosenstein Fine Art in Beverley Hills, and Holly Johnson Gallery in Dallas, and has presented his work in the UK, Australia, Turkey, Italy, Spain, and Czech Republic, and throughout the US. John Randall Nelson is a Phoenix-based artist working in sculpture and painting, detailing contemporary life through amalgamations of the mundane amidst the abstract. Nelson’s work toes the line between figurative and abstract, encouraging the viewer to do more with less, creating their own story from the layered and degraded images contained within. The artist carries an MFA from Arizona State University and is an instructor at Phoenix College. Locally, Nelson is represented by Gebert Contemporary.